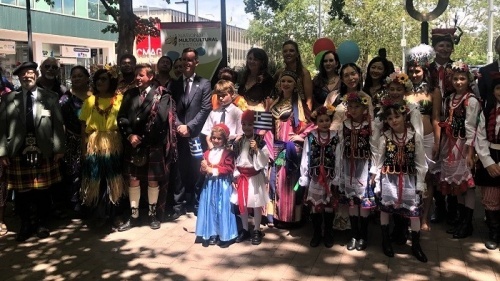 SURROUNDED by colourfully-clad dancers and volunteers, ACT Minister for Multicultural Affairs Chris Steel officially launched the 2019 National Multicultural Festival this morning (Friday, February 8) in Petrie Plaza. 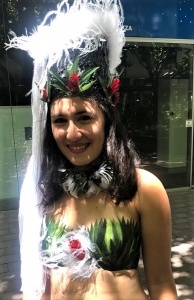 After performances by Pacific Islanders from the “United Nesian Movement” and a young Polish dance group, the hungry crowd descended on an outdoor banquet provided by the Pacific Islander Showcase Association. “This is just a taste of the huge line-up of hundreds of food stalls and performances on this year’s festival program,” Minister Steel said, adding he expected “tens of thousands of people” to converge on Civic over the three day event. 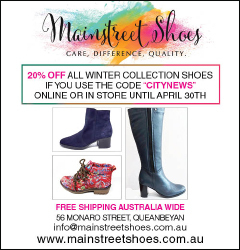 The happy minister also promised ACT government funding of $2 million over three years to ensure the event continues to be part of the city’s event calendar. 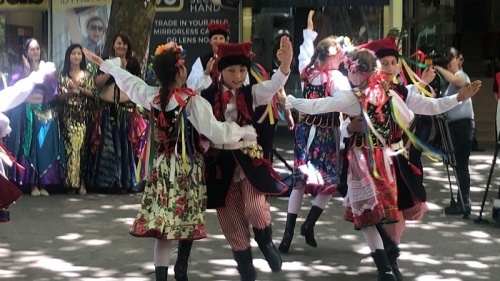 “As well as funding permanent staffing for the festival the funding will allow us to make improvements to the operations of the festival in the lead up to its 25 year anniversary in 2021,” Minister Steel said. Festival stallholders will be able to begin cooking at noon on Friday, February 15. And this year community groups, he said, would be will be selling “culturally relevant alcohol” while commercial operators will only be selling locally brewed alcoholic beverages. A highlight of this year’s program will be the three headline acts – performer Christine Anu, chef Mark Olive and Eurovision contestant Isaiah Firebrace.